I love camping! I grew up being taken off to France for 2 weeks of camping every summer. As we grew older the experience refined itself rather (from cabin tents and air beds to air conditioned mobile homes!) but the essential experience remained the same. Two weeks of living outside, running wild on a campsite and soaking up the sun. 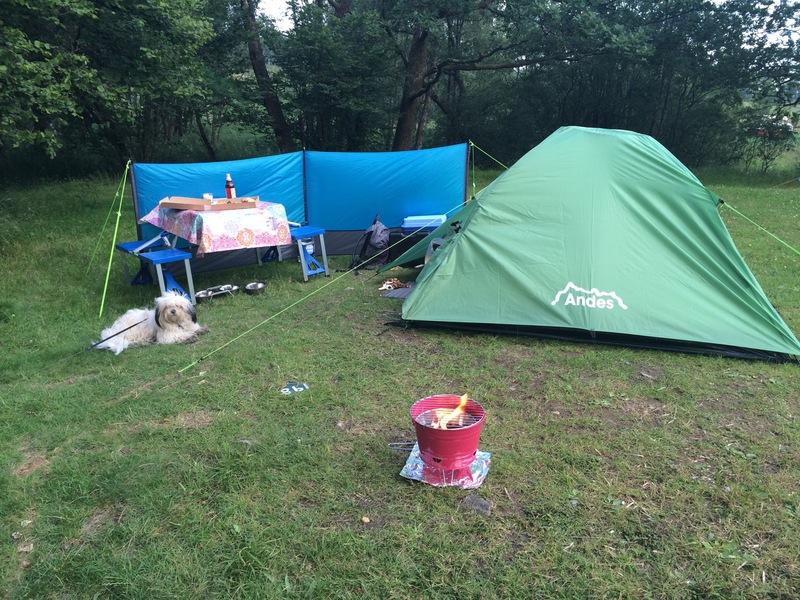 As an adult I have missed that and last year a friend and I headed south to spend a week camping in the Ardeche. It was amazing! This year, however, I lacked both funds and company. I wasn’t going to let that stop me though! A few weeks ago I headed off to the Lake District for a quick break to get some fresh air in my lungs! This tent has now been ebayed as it pitches like a drunken frigate! Now as a solo female camper I see no reason at all not to indulge myself. I try to keep it within reason and not fill the whole car but at the same time, why rough it more than you have to? The Set Up: First off, you’ll need a tent! 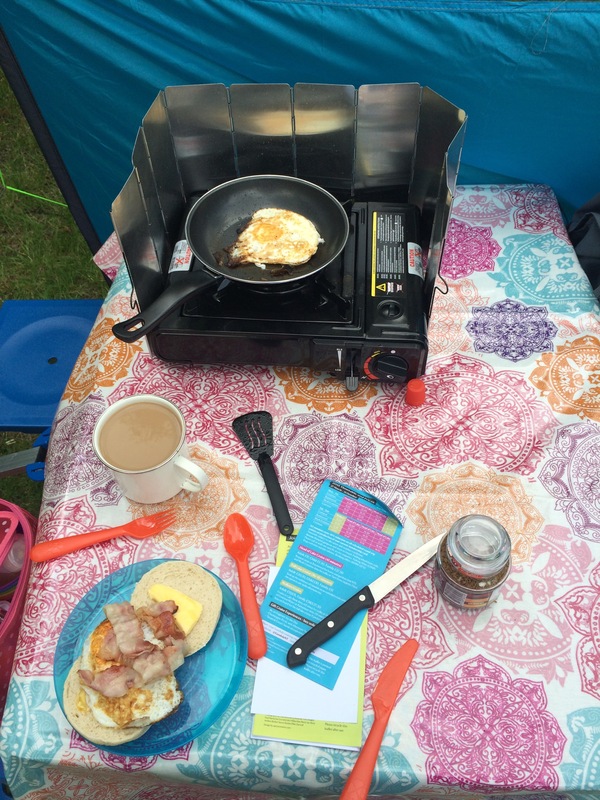 If you’re camping in England like me then go for one with a high waterproof rating. 2000 should do you nicely. This is a 3 man tent, which has plenty of space for one or even two. I also like a little windbreak, one for actually being a wind break (this is England!) and two it also provides a little measure of privacy that can be very welcome depending on your pitch. I also bring the folding picnic table so I can sit up and also use the table like a grown up! And if you’re bringing a table then why not bring a pretty oilcloth table cloth? Security: Before I go on, a quick word on safety, obviously trust your own instincts in any situation but as a solo female camper I take a few precautions no matter where I camp. I keep a personal attack alarm handy by my bed and I have a small padlock on the tent door. Small measures but they make me feel a lot safer. I’ve never had reason to need either one, luckily! Sleeping: Yoga mats on the floor under the air bed and in the centre provide much more padding than you might think. They definitely take the edge off any rocky Cumbrian ground you may be pitching on! I have a teddy bear fleece fitted sheet as well as a normal fitted sheet on my air bed and a 13.5 tog duvet. Extra fleece blankets can be added if you need the insulation. Darcy has his own little bed! 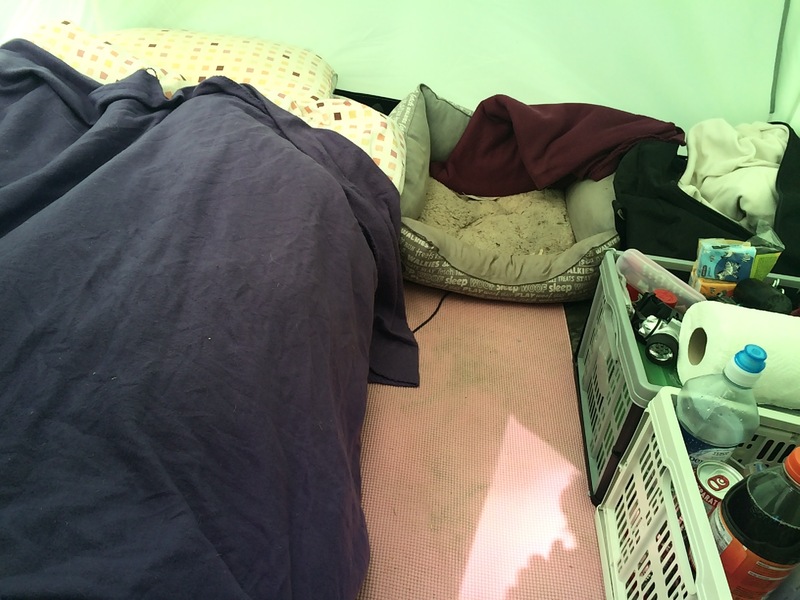 If you are camping and it’s a little colder you can add one of those reflective emergency blankets between the airbed and the groundsheet, which stops you losing heat that way. Air beds can be cold like that but I find them much more comfortable than anything else. If it’s really cold you could even place one between the inner and the rain fly if it won’t block any vents. 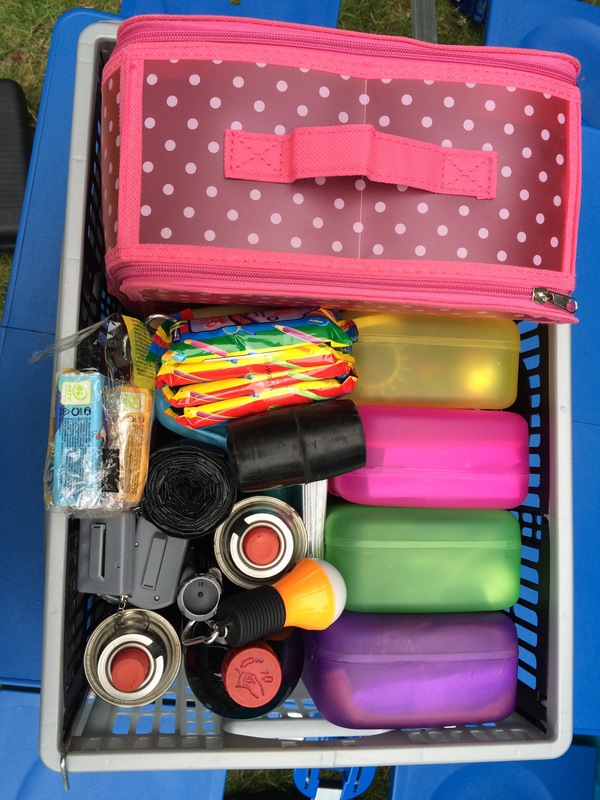 Stuff: I have one box full of camping bits and pieces that can just be slung in the car as needed and another box for food and drink. I really didn’t need half the stuff I brought with me for this trip but I’ve never knowingly packed light in my life! I’d rather have more than I need than not enough! Some essentials for this box: binbags, duct tape and tissues. You never know how well supplied a campsite bathroom may be and tissue packets are a lot more genteel than wandering round with a loo roll! I also bring a portable battery charger so I can recharge my phone and tablet while away from mains power. This way I never need to worry about whether there’s a hook up or not. Kitchen Box: Within the box of camping bits I have smaller boxes with different things in so I can grab that box as needed. 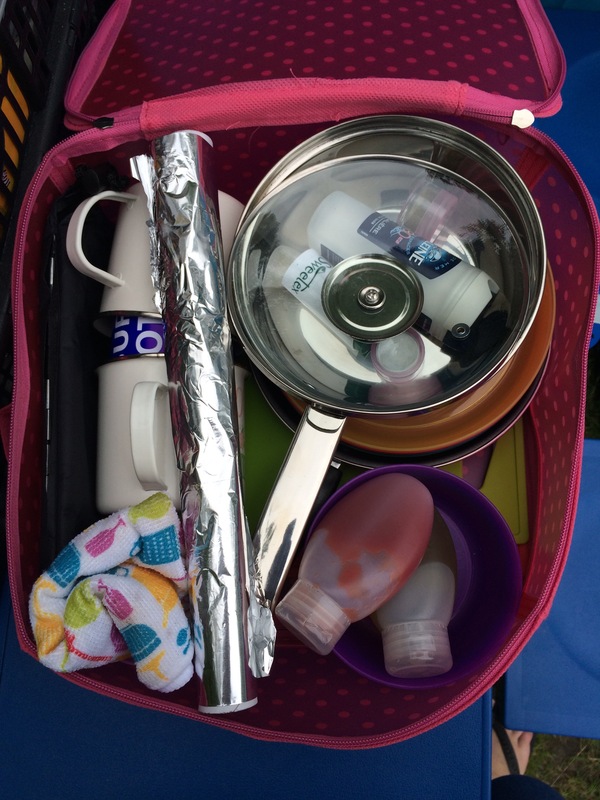 The large spotty box has my “kitchen” bits: mugs, plates, bowls, pans, chopping boards, tin foil etc. 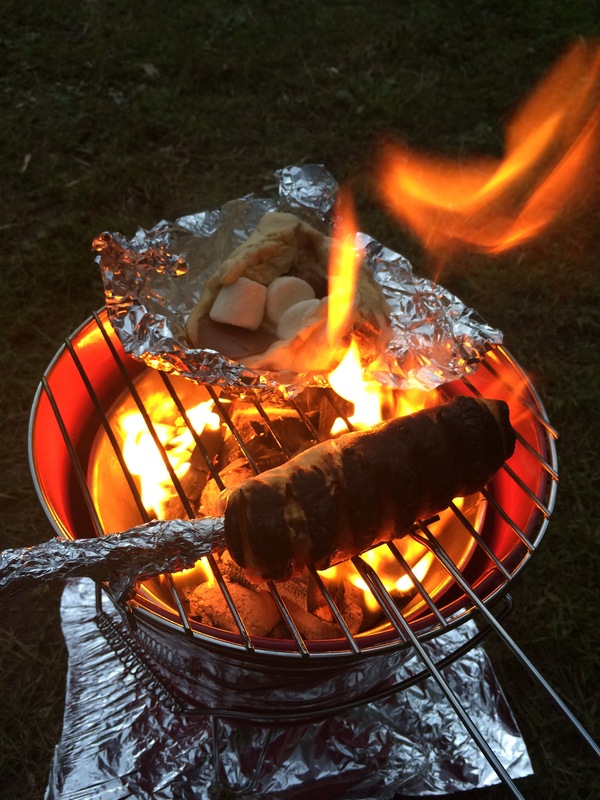 (Never go camping without tin foil! 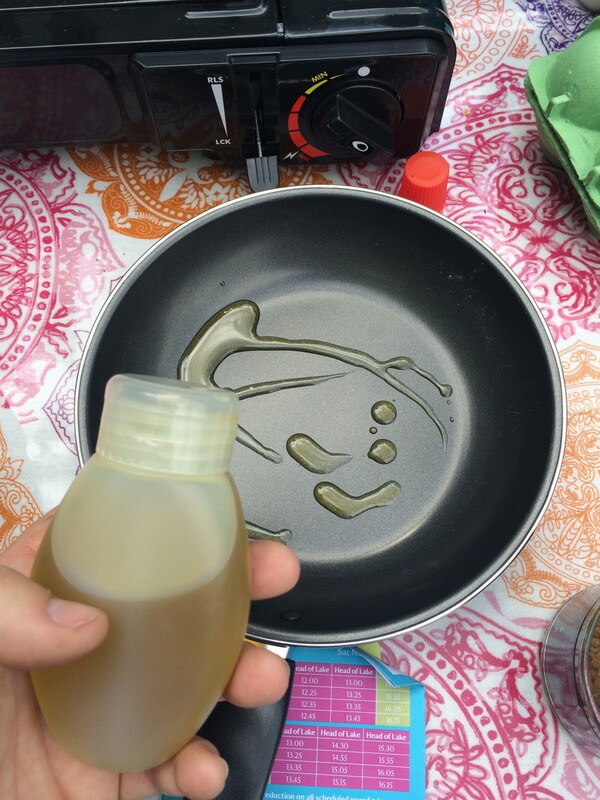 In this instance I used it to make sure the grass was protected from my little campfire as well as more normal uses! 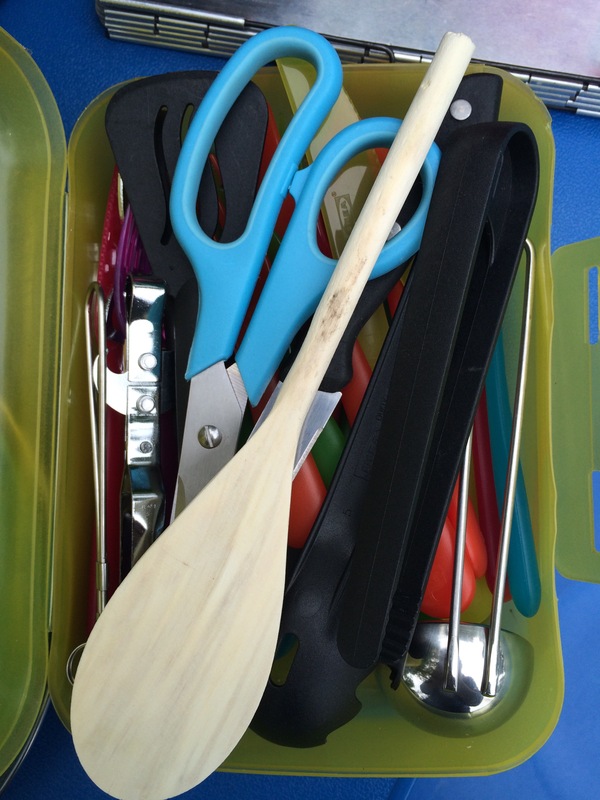 Utensils: The smaller boxes have things like the cutlery and utensils in. I cannot recommend the Children’s department in Ikea highly enough for basic but highly servicable cutlery, plates, bowls and even mini utensils! They do this brilliant set of tongs, ladle, scoopy thing, spatula and whisk that fit perfectly in the boxes I use. I imagine if you’re into backpacking where every bit of extra weight counts these might just be a godsend! And don’t forget the bottle opener/tin opener! Vital piece of camping kit, that! Also make sure you pack at least one good sharp knife. 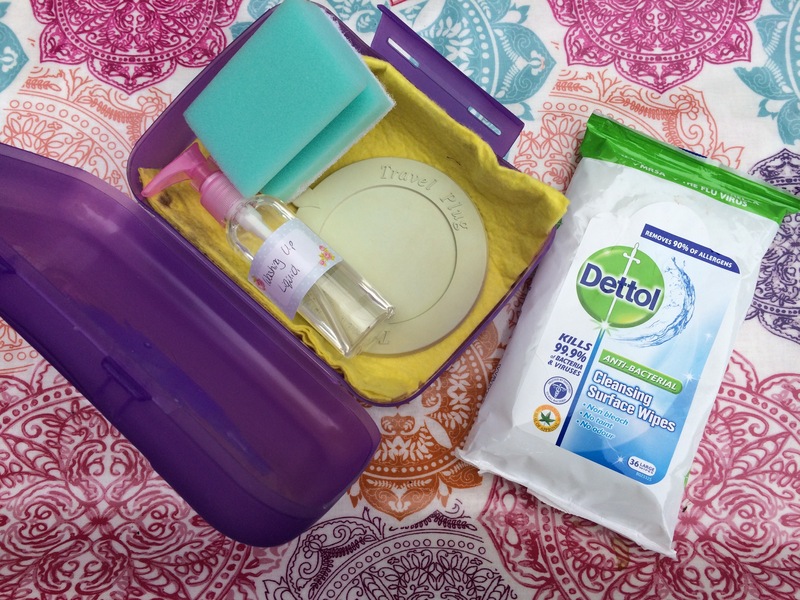 Washing Up: I also have little boxes for washing up with washing up liquid in a travel shampoo container, more on those later, and a universal travel plug, which is a very handy thing to have! 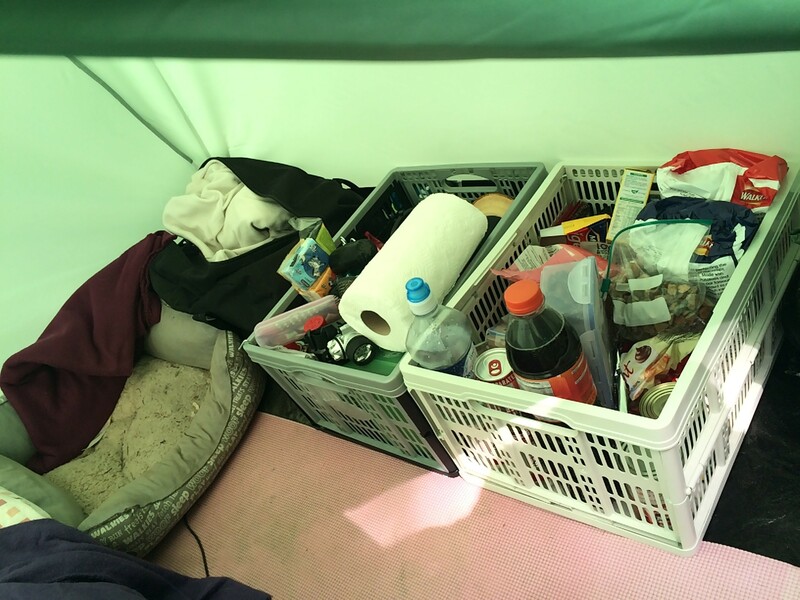 The other boxes are for Fire (fire lighters, matches, lighter) and Useful Bits like a washing line, peg extractor, bulldog clips (which are invaluable while camping for all sorts of things!) and a lollipop stick for deflating the air bed. 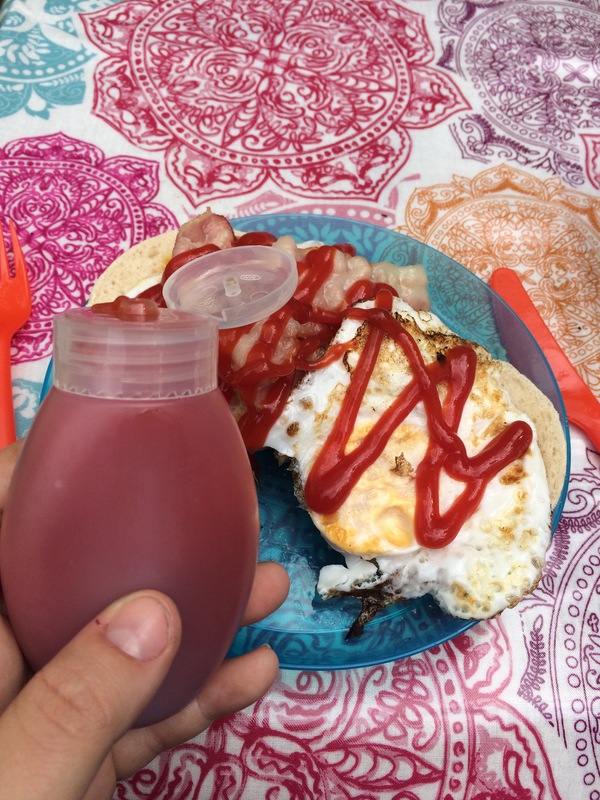 Condiments: Now, about those travel shampoo bottles! They are perfect for taking condiments for short breaks. They’re designed to hold liquids and not spill. I take ketchup, oil, mayonnaise etc in these. I also use the little screw top tubs for salt and pepper. Cooking: Now, food is what we’re about here and I think I manage very nicely with my trusty little gas hob. I could get a bigger one with a toaster and 2 rings but I have managed to resist because I really don’t need it! A little folding wind break is highly recommended though. I’m not so good at campfire cooking so I leave the campfire experiments to dessert until I get a better feel for it! Once it’s on fire it’s probably done, right?